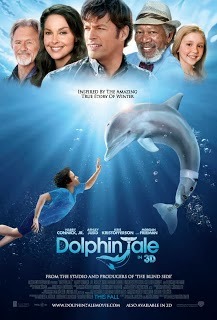 Yesterday, some homeschool friends and I went to see the premiere of the movie Dolphin Tale. I must say, I was GREATLY impressed with the movie. It was inspiring, funny, touching, and just plain fun to watch! My 10-year-old son walked out of the theater saying, "This was the best movie I've ever seen in my entire life!" Yes, it was that good. One of my favorite parts of the movie was the scene in which Ashley Judd (who plays Sawyer's mom) tells the summer school teacher that her son is learning more through his experience (at the marine hospital) than he could ever possibly learn sitting in his classroom. I have to admit that I felt a little bit envious of Hazel. I would have loved as a child to have been homeschooled in the same kind of environment that she was. I was awed by the fact that homeschoolers sold out the first showing of the movie! How great is that?! I kept asking my homeschool friends, "Do you think all of these children are homeschooled?" My friends replied. "Most must be since they are school-aged children." If you would like your children to learn more about dolphins and the ocean, the Homeschool Movie Club is offering a free downloadable curriculum that can be used after seeing the movie. It was written by Sherri Seligson (Marine Biologist and author of Apologia's Marine Biology Curriculum) and offers lessons and activities for elementary through high school-aged students. Researching creatures such as: gulper eel, Portuguese man-o-war, kelp, hermit crab, etc. Here's a link to the Dolphin Tale Premiere in which you can see the actors being interviewed by the Homeschool Movie Club. Here's a link to see Winter on a webcam. If you saw the movie, please share here what you thought of it. We saw this with our HS Group on Friday - we loved it!!! Mary, did you have a favorite scene? Yes, the beginning of the movie when Winter sang to the boy - I could just imagine she was saying, "Thank you for helping me!" I think it was about 10 minutes in and I was already crying! Also, I loved that the girl was homeschooled.